An engagement ring is bought once in a lifetime, so it is very unique and special for the buyer and the receiver. Are you planning to spend 1 month's salary, 2 month’s salary or more? The truth is, an engagement ring budget is very relative and it has no rules but different expectations. Firstly, you can create a budget and then consider her style, taste and personality. After browsing the designs, stone and metal options, check the prices and find the alternative styles which provide the closest amount that you have planned in your mind. Diamonds are always the best choice with its strong and powerful lifetime duration, but of course, since it is very rare and unique, you need to keep in mind that diamond engagement rings will be one click above the standard with their prices. The financial situation , partner’s expectation and meaningfulness of the ring are the most important factors which you need to focus on. After the budget planning, browse the styles and find the most suitable piece while considering her individual style. Regardless the price tag, if you have already made up your mind about the price range, picking up the best design is the main issue left. You need to be sure that you will get exactly what she wants and what you can afford. Therefore, instead of surrounding yourself with myths, listen to your inner voice and find the best engagement ring for your beloved which will make her happy for eternity. Which Metal Should I Prefer? This is a very personal choice because each woman has a different style so first of all you need to consider her taste, her outfit and pay attention to her jewelry pieces’ design and colours. 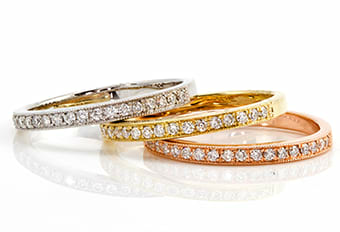 If she is a classic lover, a timeless yellow gold might be a great option. On the other hand, if she likes contemporary designs, white gold can be very suitable for her. Platinum is a great choice if she wears the ring everyday and also has an active life. Palladium perfectly suits her feelings with its light weight. If she is a romantic princess, the warm pinkish tone of rose gold will make her very happy. Which Style Should I Prefer? Which style should I prefer? (We won’t recommend the classic solitaire. We will go over all the unique styles like paved stones, halo..etc.) The ring style shows your personal taste and is a physical proof of your unique style and because of this reason every jewelry designer and brand knows the importance of wide selection to meet with many different looks. Solitaire Pave: If you are a classic lover and a minimalist, a simple but sparkling solitaire pave style will suit you.The tiny metal beads and prongs add an extra sparkle to the stone and highlight the center stone perfectly. 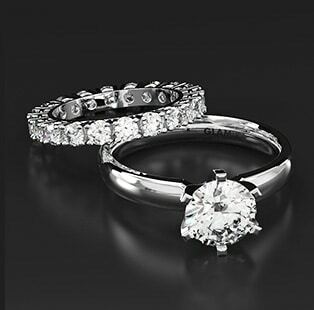 You can obtain a modern or vintage style according to your taste with a solitaire pave. Halo: Are you staying on trend and are a fashion-forwarded, but also delicate? A style of halo must be your choice. Halo design creates a bigger center stone appearance and enhances the brilliance with accent stones. Flower: Do you like elegant and pretty floral models, but are you also a fan of head turning designs? The flower collection helps you get a unique look with plenty of dimensions. If you have small and elegant hands or fingers, the gentle models present a graceful look. Exclusive: If you are adventurous,creative and free-spirited, the exclusive collection will meet with your expectations. We know that the beauty stands in the detail, the delicately crafted designs will help show the prominence of the center stone. Tension: If a modern and contemporary look is the description of your style, the unique appearance and enchanting light reflection of tension design with minimal metal surrounding will suit you very well. 3 & 5 Stones: 3 stone engagement ring style is the symbol of your past, present and future, so its message is timeless and eternal. The accent stones can be either the same stone size or can be smaller than the center stone.If you like sparkling models, 5 stone ring style can be your choice because the design provides maximum brilliance and an eye-catching light reflection. Side Stone: Is all you want more glow and more luster for your style? If you like being a star and love turning the heads around you, here is the side stone selection for you. The attention-grabbing appearance leads the eyes toward on the center stone and creates a noticeable shimmer on you. Design Solitaire: If non-traditional and unique styles are attractive for you, the modern touch of design solitaire collection will allow you to create your ideal model. Break the classic rules and start a new movement by creating an ultra modern style. Pearl: If you are a trendsetter and always go with a different one, the breathless pearl rings are waiting for you. The timeless and elegant beauty of pearl will be by your side forever and will add a sophisticated look. You can combine your pearls with coloured gemstones or a classic diamond. Which Stone Should I Prefer? The stone colour plays a big role in your personal preference and it is very essential to select the right stone. Explore the secret meaning of gemstones to make your engagement ring extra special. Diamond: The pure beauty and the innocence of the diamond will take your breath away.The splendidly sparkling and timeless beauty has been adorned by women for centuries.The simple and innocent beauty of diamonds will certainly make your engagement ring a very special one. Black Diamond: Assertive and extraordinary... The solid look and the strong desire of black shade symbolises stability. If you have a certain and a high-brow style, black diamond definitely will make you glad with its mysterious look. If you have a contemporary or sophisticated look, this timeless fashionable colour will add confidence and style to your spirit. Emerald: We are calling all the spring lovers here! The unique and deep green is the symbol of love and rebirth. We are calling all the artists and creative people here because the emerald engagement ring will be their favourite! Emerald is also the symbol of a happy and a successful marriage. Sapphire: The highly saturated blue tone is the meaning of loyalty and trust. The amazing deep blue creates an ultimate charm and a calm feeling with its watery feeling and deep ocean blue colour. If you have confidence and strength, this is your stone. Ruby: Strong feelings and the most beautiful love storms...Ruby adds passion and royalty to your engagement ring.The deep red vibration creates richness and an essential beauty.If you have an ambitious and outgoing personality, ruby is definitely for you.It is the symbol of unconditional love and true passion. White Sapphire: If the nobility, classy and mysterious describe you, this colourless and timeless elegance is all yours. If you have an inner harmony and take this harmony to every place you go, white sapphire is a perfect choice. Amethyst: The mystic purple look has a very high energy and creates a great combination with white gold, palladium or platinum. If you like a strong and a contemporary look, you can check our Amethyst collection. Citrine: If you have a high energy, the bright shine of citrine must be your choice. The colour shade is like a present from the sun and makes your statement bold and strong.If you have an optimistic and a social character, this graceful stone is going to uplift your personality. Blue Topaz: If you like bright and strong blue shades, blue topaz will add an extra attention to your engagement ring. The unique sparkle will keep all eyes on you and the seductive blue shimmer will be the symbol of your loyalty. Garnet: The most elegant red shade creates a very intense and strong statement. It is the colour of life and vitality so if you have a very high life energy, a big love for life and support it with your eternal love, garnet is your stone. Garnet is a lifelong romance for your true love. Peridot: A fairytale power and the light reflection will capture you if you like green-yellow colour tones.The earth tone will remind you of the mother nature and her speechless beauty.It also has a secret message between you and your beloved which is ‘’I trust and love you’’. Aquamarine: The stunning blue colour and the brightness of deep blue shade creates a perfect match with any metal colour. The eye- catching fresh look will take you to a smooth moment with its elegant beauty.The tropical ocean blue is the expression of your love. Fireopal: The deep orange has a strong vibration of hues and it reminds us of the romantic sunset time near the sea coast. Its high energy gives a positive vibe to our souls. It is also the symbol of enduring happiness and suits creative dreamers. If you follow your dreams and are an all time positive no matter where you are, a fire-opal engagement ring is going to be your biggest supporter. Green Amethyst: The light green shade is the symbol of renewal and if you like a stunning yet a rare look, the green amethyst is a very good option for you.The new chapter of your life and also a new beginning. If your personality always welcomes the new challenges, green amethyst suits you very well with its beautiful rare colour tone and the meaning it carries. Green Tourmaline: If you have a joyous spirit and if you balance your surroundings, the green shade of green tourmaline is going to complete your character. Celebrate the biggest moment of your life with a green tourmaline engagement ring. Pink Tourmaline: The romantic but bright vibration of pink will capture you at first sight. It is the colour of pure love and the sweetest pinkish tone that you can ever find. If you have a fancy and a pretty style, pink tourmaline engagement ring offers a lot! It is also a constant reminder of your deep love. Rose Quartz: The smooth and soft pink colour will create a romantic look on you. Not too much attention, but easy to recognize! The calm energy of rose quartz is like a port that you always want to shelter in just like your relationship. If you are a true romantic,keep this beautiful moment in your engagement ring forever with a rose quartz. Smoky Quartz: The mystery of stone colour will provide a unique look to your engagement ring. It gives the owner a natural feeling with its warm coffee tone. It has an earthy look so all nature lovers can wear this stone and honor the Mother Nature. Not too flashy because it is time to down-to-earth! Tanzanite: This one-of-a- kind gemstone is very unique and if you like rare, beautiful and eye-catching pieces, tanzanite must be your choice. The deeper and richer colour shade creates a big difference on your engagement ring. Its uniqueness is adorable and the amazing colour shade is stunning. If you like extraordinary, tanzanite is going to amaze you and your beloved.